"That's what I should expect if I stick my ideas out there onto the internet". This was my daughter's mature reaction the other day when a group of people took exception to one of her tweets. Their reaction had hurt her, and was unexpected, but not unusual. People seem to feel able to be more robust in their comments when they are not face to face, even with people they haven't met. I know this is a big issue for some clients. Maybe they are tweeting or blogging on behalf of a large organisation which attracts public criticism and therefore attract a lot of online vitriol. Is impossible not to be hurt by this, no matter how much they know it is not aimed at them personally. 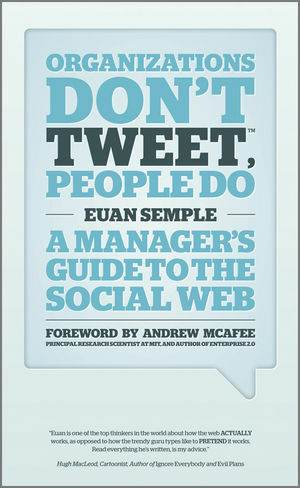 Remember Organizations Don't Tweet - People Do! Just to be clear I am not talking about disagreement or dissent here. That is a good thing, and a large part of why I do what I do. But it is the rudeness and aggression that seems unnecessary, whether intended or just a result of carelessness.